Fifty years ago, and long before the introduction of the World Golf Rankings, one sportswriter in Reading, Pa. asked what’s now become an age-old question, “Who’s the greatest golfer?” At the time, the debate was between Jack Nicklaus and Arnold Palmer. This journalist cast his vote for the Golden Bear. At the date of publication, a 27-year-old Nicklaus was fresh off the heels of his victory in the inaugural Westchester Classic at Westchester Country Club, with rounds of 67-69-65-71. He went on to win the event again in 1972, becoming the first multiple winner of the tournament that evolved to become the PGA TOUR’s The Northern Trust at Glen Oaks Club—just 35 miles down the road—and the first leg of the FedExCup Playoffs. For his victory, Nicklaus won $50,000. This week’s winner will receive $1.575 million—a payout 31.5 times the size of the Golden Bear’s check. Some things change and some things stay the same. 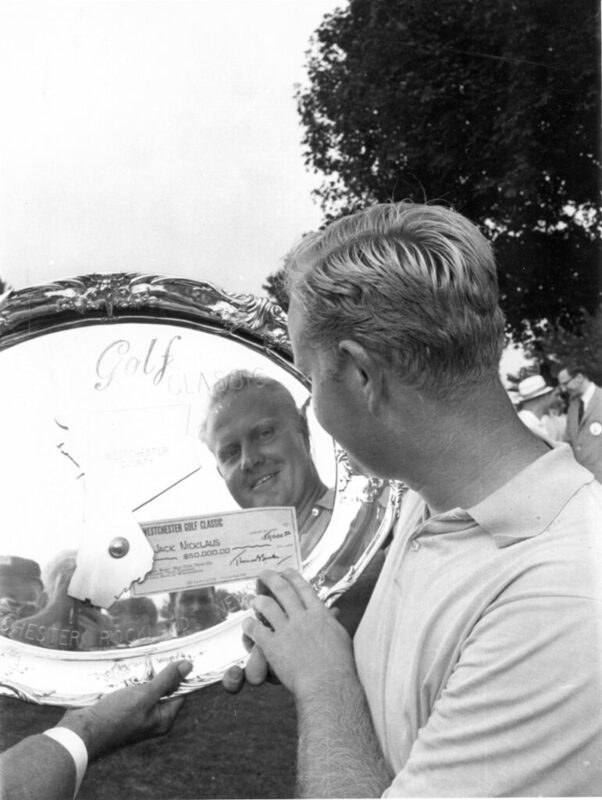 Jack Nicklaus won the inaugural Westchester Classic on August 27, 1967, the precursor to The Northern Trust and the first event in the FedEx Cup Playoffs. Harrison, N.Y. (UPI)—Who’s the greatest golfer in the world today? It’s funny, but nobody will say. Arnold Palmer won’t say and Jack Nicklaus won’t say for reasons that are obvious, and the vast majority of their fellow golfers won’t say, either, because they don’t care to make a lifelong enemy. Okay, I’m not on the TOUR and I believe Jack Nicklaus is the foremost golfer in the world today. I base my opinion primarily on two reasons—my eyes. I think Arnold Palmer is one of the greatest golfers to come along in this generation, but I think Jack Nicklaus is better. Not by much. Maybe by as little as a club length. By winning the Westchester Classic here yesterday, he raised his money winnings for the year to $156,748 and surpassed his own previous single PGA record of two years ago. Palmer has won a little more than $900,000 since starting on the TOUR and Nicklaus has banked $684,000, but it has taken Palmer 14 years to earn that much while Nicklaus has accumulated his total in half that time. And the clincher may be the fact that Nicklaus has finished in the top five of all the tournaments he’s entered nearly 60 percent of the time, while Palmer figures out only 40 percent. Most golfers who make their living on the TOUR shy away from picking Palmer over Nicklaus or Nicklaus over Palmer. Doug Ford declined to choose between them, also. Veteran Lionel Hebert said he’d never pick one particular golfer, he’d have to pick 10. They say the best place to go for any answer is the source, but Nicklaus and Palmer aren’t much help in this particular case. “Great—great,” each says about the other. That much I figured out myself.